Western Diocese - On Friday, October 16, His Grace Bishop Maxim, accompanied by Fr. 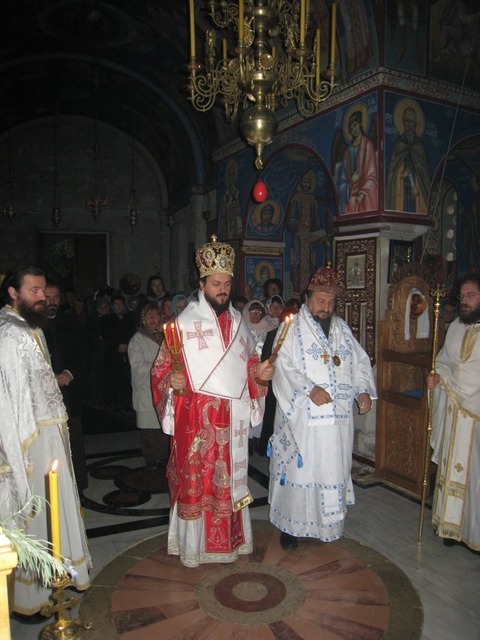 Gregory Edwards, a priest of the Western American diocese currently studying theology in Thessaloniki, Greece, traveled from Belgrade to Tvrdos Monastery in Herzegovina. They first flew from Belgrade to Tivat, Montenegro, a picturesque town on the Adriatic coast. There they were greeted by a devout parishioner from Trebinje, who drove them into Bosnia and Herzegovina. Upon arriving in Trebinje, His Grace was greeted with great joy and brotherly affection by His Grace Bishop Grigorije of Zahumlje and Herzegovina at the city’s newly constructed cathedral and diocesan headquarters. After venerating the icons and the altar inside the Church, he visited briefly with Bishop Grigorije in his residence before driving where he was once again greeted with great joy by His Grace Bishop Atanasije (Yevtich) and the monastery’s brotherhood. On Saturday morning, Bishop Maxim celebrated the Divine Liturgy with Bishop Atanasije, with Fr. Sava, the monastery’s abbot, Fr. Gregory, and hierodeacon Porphyrios serving as well. After Liturgy, Bishop Grigorije joined them for lunch and discussion with Bishop Atanasije. Bishop Maxim and Fr. Gregory were blessed to have a lot of time with Bishop Atanasije, listening to his stories, jokes, and advice. Around 12:00, Bishop Maxim and Fr. Gregory, accompanied by the abbot, Fr. Sava, left Tvrdos for Decani Monastery in Kosovo. Driving through the beautiful black hills of Montenegro and past Ostrog Monastery, then through Niksic and Podgorica, they arrived in Pec late in the afternoon and venerated the icons and relics in the three churches inside the Patriarchal Cathedral. They also visited briefly with the sisters of the monastery before driving on to Decani, where they were greeted by His Grace Bishop Teodosije of Lipjan and the monastery’s brotherhood. On Sunday morning, Bishop Maxim celebrated the Divine Liturgy with Bishop Teodosije, with Fr. Sava, Fr. Gregory, three hieromonks, and two hierodeacons from Decani serving as well. Bishop Maxim delivered the sermon on the topic of power in weakness. The monks’ beautiful chanting, accentuated by the fabulous acoustics of the large church, is a unique mix of old and modern Serbian chant along with Byzantine chant. After Liturgy, Bishop Maxim, Fr. Sava, and Fr. Gregory were given a tour of the monastery by Bishop Teodosije, in which they saw where the monks keep their cows and goats, where they produce their own milk and cheese, as well as their iconography studio. They then ate lunch with the monastery’s brotherhood and pilgrims and enjoyed a discussion with them before departing for Djakovica, a town in which five or six godly women live together behind large walls and an armed guard, preserving the site of a parish church that was burnt down in 2003. The women of this small group, which is led by “Tetka” (“Aunt”) Poljka, are, as one of the monks from Decani put it, like modern-day confessors. Bishop Maxim, Bishop Teodosije, Fr. Sava, and Fr. Gregory visited with the women and toured the construction of the new parish church, which is currently underway. Until the church is completed, the fathers of Decani Monastery come out from the walls and armed guard of their own ghetto to bring Holy Communion to the women, recalling the days of the early Church when the priests and deacons would ferry Holy Communion throughout their cities. After taking leave of Bishop Teodosije and the women, Bishop Maxim, Fr. Sava, and Fr. Gregory drove through Pristina to Gracanica to visit the monastery and His Grace Bishop Artemije Rashka and Prizren. As they entered the Serbian enclave of Gracanica, they did not cross any border, but the atmosphere changed perceptibly. As one monk at Gracanica put it, there is “an invisible border, and everyone knows where it is.” Arriving at the monastery, they passed through a phalanx of KFOR soldiers from Germany, Austria, and Switzerland, before being greeted by Bishop Artemije and the sisters of Gracanica monastery. After visiting with Bishop Artemije, they venerated inside the famous church, then visited the sisters’ iconography workshop. Sister Magdalena is now working on a special icon for the diocese of the Mother of God, Queen of Angels, Protectress of Los Angeles. They finally left the monastery around 4:00 to begin the journey back to Belgrade. On the way out of Kosovo, they drove through Gazimestan, singing the hymn to Holy Martyr Lazar of Kosovo and thanking God for a wonderful trip that was full of blessings.